Ever wonder, how your in kind donations reach in the right hands? 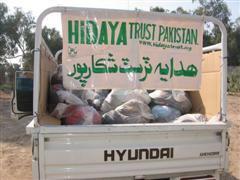 Hidaya Foundation routinely sends containers to Pakistan where contents of the container are warehoused and distributed to the poor and the needy. While it sounds simple, the actual process from the collection of donation to its distribution to the needy is a long and complex set of well-coordinated events. 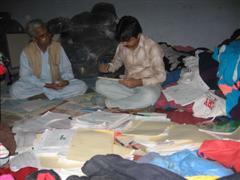 Each step in the process requires constant monitoring to ensure your donations reach the needy. If you have ever wondered what happens to the in-kind donation you drop off or ship to Hidaya Foundation’s warehouse – this short write-up will help you understand what goes on behind the scenes with your donations that eventually benefits someone in dire need. Though many of our donors visit Hidaya Foundation’s warehouse in Milpitas, CA to drop off their in-kind donations, a good number of them mail or ship their in-kind donations to us as well. 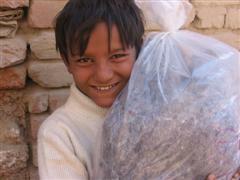 Items vary from warm clothes, blankets, children’s toys, books to computer and hospital equipment. If you bring donations in person, you will be asked to fill out a 2-part in-kind donation form; one part is kept by Hidaya Foundation for its records, while you take the other part with you as your proof for tax-deduction. For those who send their donations by mail, the form can be downloaded from Hidaya Foundation’s website and filled out and sent along with the donation. After verifying the goods received against the donation form, the donor portion of the form is mailed back to the donor. When the goods collection reaches a level enough to fill a 40 foot-long container (the kind you see on an 18 wheeler on US highways), several of Hidaya Foundation team and volunteers join hands to fill the container with your donations. The container is carefully loaded to ensure efficient use of space, yet in a way to allow the goods to reach the destination safely. 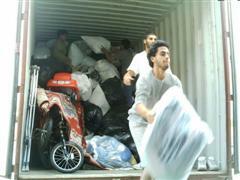 Bags of clothing and blankets are packed such that they act as cushion to more precious cargo in the container. 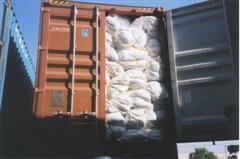 After packing, the cargo is tied by a rope to secure the goods from falling out when the doors are opened. The packed container is then taken to the Oakland seaport and loaded onto a cargo ship. It takes around 2 to 3 months to reach Karachi, where Hidaya agent clears the container through Pakistan customs and ships it by road to Hidaya’s warehouse in Shikarpur. Once the container arrives in Shikarpur, our local team promptly unloads its contents into one of our two warehouses and then sorts the items in preparation for distribution. Besides Shikarpur, Hidaya also maintains a warehouse in Abbotabad closer to the regions affected by the recent natural disasters. 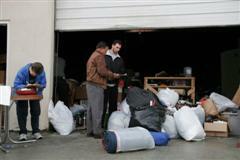 Once sorted, the items are sent to places where the need has been identified. Distribution of goods is done in area of need through our team of employees and volunteers. As an example, the city of Shikarpur, Sind has been divided into 13 districts to allow for efficient and equitable distribution. The recipients include orphans, widows, sick elderly, and the poor. Smaller trucks and vans are loaded from the warehouse to carry the goods to remote areas for distribution. The results are often happy faces such as this one – a child who will treasure this blanket which came from a generous person like you – some one who knew that it can be used for a good purpose instead of letting it go to waste.